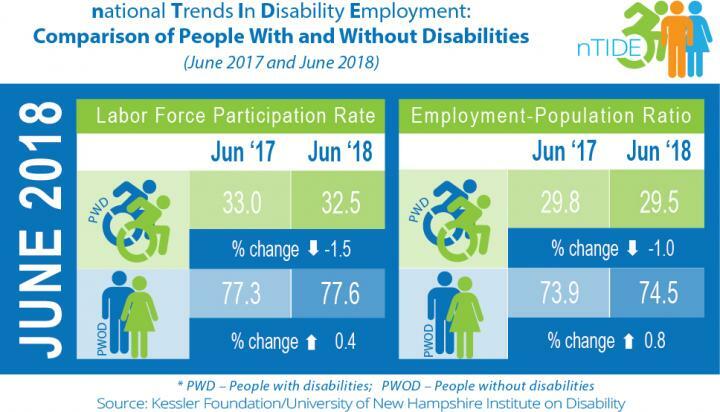 A modest downturn for June indicated the end of 26 consecutive months of job gains for American with disabilities, according to today's National Trends in Disability Employment – Monthly Update (nTIDE), issued by Kessler Foundation and the University of New Hampshire's Institute on Disability (UNH-IOD). As we observe the anniversary of the Americans with Disabilities Act (ADA), this is a fitting time to reflect on the progress that has been made toward ensuring equal access to employment for people with disability in American society. Kessler Foundation has released a white paper detailing the factors underlying the success of its funding initiatives aimed at increasing the participation of people with disabilities in the workplace. "This is the first month in over two years without improvement in the employment situation for people with disabilities," according to John O'Neill, PhD, director of employment and disability research at Kessler Foundation. "This disappointing downturn may be similar to a pattern we saw at the end of 2015 and the beginning of 2016 with a number of months of gains followed by several months of losses. Let's hope that this pattern is not repeating itself." "The last few months saw the slowing down of gains for people with disabilities, and now we are seeing the end to a long, unprecedented stretch of gains for people with disabilities. It is far too early to say that the trend is reversing. We'll see what happens in the coming months, so stay tuned," said Andrew Houtenville, PhD, associate professor of economics at UNH and research director of the Institute on Disability. This month marks the 28th anniversary of the ADA – legislation that supports inclusion for people with disabilities in our communities and workplaces. Looking at what has been accomplished through targeted grant making provides a blueprint for ensuring that people with disabilities continue to contribute to the growing need for workers in today's expanding economy. The lessons shared in the Kessler Foundation white paper are relevant to all who strive for greater inclusion in the workplace. "Employing People with Disabilities: Lessons from Kessler Foundation's Signature Employment Grants," draws from the independent evaluations of selected grantees by the Heldrich Center for Workforce Development at Rutgers University. Kessler's Signature Employment Grants program provides major funding for innovative projects across the nation. In the white paper, five elements are identified as common to successful projects funded by Signature Employment grants: A focus on changing attitudes about people with disabilities and their ability to work; a person-centered approach to employment; technological platforms or model documentation; strong community partnerships; and wraparound services. "Success was based on several factors," explained Elaine E. Katz, MS, CCC-SLP, senior vice president of grants and communications at Kessler Foundation, "including an increase in jobs and the satisfaction of program participants and employers, as well as the potential for funded projects to be self-sustaining and replicable. These outcomes support maximal impact for our funded employment initiatives, and the best possible return on our grant making – solid gains for jobseekers with disabilities." In June 2018, among workers ages 16-64, the 4,518,000 workers with disabilities represented 3.1 percent of the total 146,821,000 workers in the U.S.
Join our nTIDE Lunch & Learn series today, July 6, at 12:00 pm Eastern. This live broadcast, hosted via Zoom Webinar, offers attendees Q&A on the latest nTIDE findings, provides news and updates from the field, as well as invited panelists to discuss current disability-related findings and events. Amie Lulinski, PhD, FAAIDD, will join Dr. Houtenville, Dr. O'Neill, and Denise Rozell, policy strategist at AUCD, to discuss the State of the States in Intellectual and Developmental Disabilities, a longitudinal, comparative, nationwide study of financial and programmatic trends in supports and services for people with intellectual and developmental disabilities and their families in the U.S. Join live, or watch the recordings at: http://www.ResearchonDisability.org/nTIDE.